In which Selkie re-writes the lyrics to the national anthem. From a species that we have no indications didn’t naturally evolve on earth. Sarnoth shares territory with the United states giving the strong possibility that she was born on American Soil and is thus a native, and regardless she has citizenship papers indicating that even if she’s not native born she’s naturalized and she’s the legally adopted child of an American Citizen, thus she’s American. Kids need to brush up on the law, my school taught us what makes you a citizen in the second grade. The child was legally adopted under the age of 16 years. While she was legally adopted under the age of 16, Todd hasn't had her for two years. So the "automatic citizenship because she's the legally adopted child of a citizen" thing doesn't apply. Good thing she's been naturalized. That’s interesting. Half a paragraph of what I wrote has disappeared, and I linked to a website – How Foreign Born Adopted Children get US Citizenship. The link disappeared. Anywho, that little list I posted is what is required, by US immigration law, for a child to be considered “an adopted child”. Wonder if the link will work this time? Did you perhaps use Greater-Than, Less-Than signs to make a emote-face? I’ve been in comment threads that are coded to consider anything on the wrong side of those symbols as html code and not visible text. Quite possible. I used a greater-than sign at the end of the first sentence. I was using those to show that what I put between them was not my words, but had been written by Rater202. Probably should have used quotes “”. I’ll try to remember not to use them, here, anymore. I’m still rooting for the “parallel evolution” background for Sarnothi. It’s more interesting than the “landed aliens” one. Though as the Sar-Teri put it, Sarnoth “shares territory”, that pretty much only applies to a flat, 2D map. No one every tried to claim the BOTTOM of Lake Superior as US/Canadian territory… and if we may judge by the fishing ban many years back, presumably these human nations have conceded the lake’s surface to be of Sarnothi sovereignty also (they just didn’t want to do so publicly). So… Selkie’s claim to have been born in US territory may be a bit… disputable. Wrong. Nations and provinces/states do claim the bottom of lakes. If you find a shipwreck in the middle of Lake Superior, before you can dive and retrieve anything from the bottom, you have to find out which side of an imaginary line it is on, and then get permission from either Canada/Ontario or the USA/Michigan (or Wisconsin or Minnesota, if it’s in the western end of the lake). And the nations and provinces/states will claim a share of anything of value you bring up from the lake bottom – if they don’t just take all of it. My theory with the Sarnothi origins is that humans were originally really advanced before an apocalyptic event bounced them back to the stone age, and the Sarnothi are a byproduct of that civilisation, specifically humans engineering themselves with fish traits, which would explain in fact why they they are basically humans with fish traits, along with their advanced technology. I’d argue, assuming they were in fact originally from Earth, that its a case of covergent evolution, i.e. similar outcome from different starting points. Aside from the general bipedal shape they seem significantly different from humans biologically. Reproduction is completely different, diet is different, heck their poisonous saliva is different. I think its far less complex to imagine a species of fish that evolved separately towards sentience than genetic manipulation by ancient humans. That said, I’m still not convinced they aren’t a refugee species who landed on earth and settled in a long time back. The Great Lakes seems an incredibly small place for a species like that to both evolve as far as they have AND remain largely hidden for so long. Dave referred to Selkie’s Echoness as “Earthling” powers on the previous page. I think that’s slid confirmation that they’re from earth. Yeah, Master of the Universe- Dave, never did explain what was in the 2600 pages of info that Ms. Haversham-Zhang pushed across her desk to Todd when the adoption papers got signed. Selfie is from Earth, that doesn’t mean her species originated from Earth. Selkie not Selfie. Stupid autocorrect. If Sarnothi are not from Earth, then their powers would not be Earthling Powers. Since being an Echo is a Sarnothi power, and that’s the only super-powers that Selkie has, the obvious confclusion from a statement that her powers are earthling powers is that the powers originate on Earth. Unless the Earth is magic and triggered X-Men style mutations in a minority of Sarnothi that came to earth, the logical inference is that that they’re native to the Earth. Selkie is from earth therefore Selkie can accurately be called an earthling. Since Selkie is an earthling and Selkie has powers her powers can therefore accurately be described as “earthling powers” even if her species is not originally from earth. 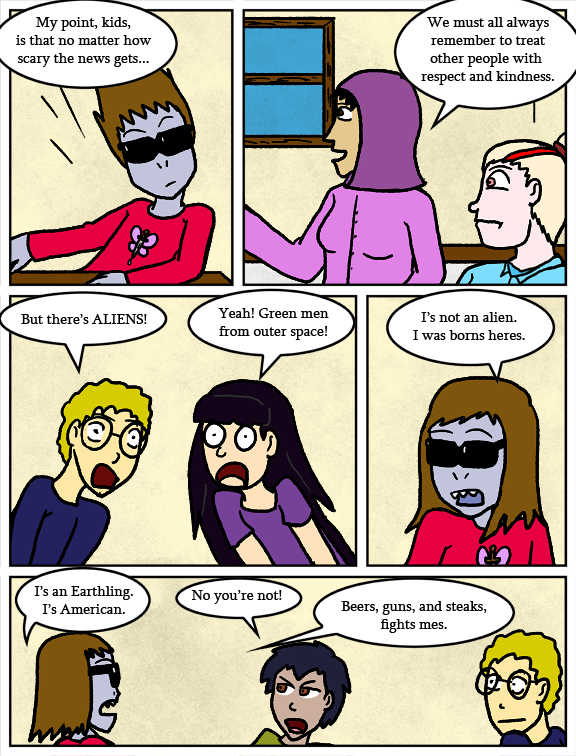 Her powers can also be described as “alien powers” if her species is not of this earth. English is a language flush with ambiguity. And Dave would be far from the first author to use language in a mysterious and/or misleading manner. You may have taken Dave at his literal word, and that’s fine, but that doesn’t mean those of us who are still undecided are wrong. There’s still ample wiggle room for Dave. I thought that too, for a moment. But Dave said, “Technically…” and if one is going to split technical hairs, especially as a joke, it’s quite possible and logical to maintain that whatever powers Selkie has, they’re earthling powers, because she was born on earth and is therefore an earthling. From Earth but a case of convergent evolution? That would mean we could trace her evolutionary tree through other related animals on Earth, right? She has blue blood: Are you saying she evolved from horseshoe crabs? Really, if you go back far enough, EVERYTHING has a common ancestor… but human’s relationship to Sarnothi probably split somewhere around the time our ancestors crawled out of the sea. Partly true. Humans didn’t evolve from any ape living today but the common ancestor of humans and modern apes was still an ape. And as Danny points out; we didn’t stop being apes. She evolved from W.A.S.P.s, apparently. joecrouse, I’d like to shake your hand! Many arthropods have cyano-based bloods. But yeah, I’d argue for either convergent evolution or significant evolutionary divergence. There’s evidence that Humans were once on their way to becoming aquatic- the webbing between our fingers and toes, our relative harilessness, our ability to hold our breath, how well our eyes work underwater, and the instinctive breath holding and swimming of babies when they’re born. Now, venom and poisonous bodily fluids are something that could easily evolve from humans- our sweat glands are already a specialized, unique glandular system, so modified salivary or endocrine or other glands isn’t that strange. And of course, webbed digits, claws and different kinesthetic forms are already a thing that some people have. (well, maybe not so much the claws, but you get my point). The BIG issues are the blood coloring and the location of the gills. I, with my admittedly limited knowledge of evolutionary biology and chemistry, can’t think of a way that hemoglobin-using mammals would evolve to have copper-using hemocyanin instead of or in addition to their red blood cells (since hemocyanin is a free-flowing protein instead of one inside a cell it’s possible that Sarnothi have BOTH.) Then again, it looks like Lake Superior has the highest concentrations of copper among the Great Lakes, and due to its coldness, also has the highest concentrations of water-soluble copper, so it’s possible that that evolutionary trait was caused by environmental stressors and a single highly-successful mutation. The gills, though… Generally speaking, gills are NOT on the torso. They’re usually a modified cheek structure or in the throat- and considering that the closest analogous structure that humans have to gills is the larynx (in the throat) I couldn’t see gills evolving as an extension of the existing respiratory system instead of being a third branch within the throat (esophagus, trachea and gill-tube). It’s honestly JUST the gills that make me think they don’t have any common ancestors in the hominid family, because the only other creature I can think of with both gills and lungs is the Axolotl, and they don’t have both active at the same time, usually. Amphibians have lungs, and co-opted their skin as a secondary 02 source, lungfish are the opposite, having gills and co-opting their stomach lining as a ‘lung’, and terrestrial crustaceans have gills modified for ‘breathing’ air. I can’t think of a single creature with both that are equal. Now, if Sarnothi lungs were adapted to get 02 from water, I could see it. The reproductive system is also a BIG issue. Laying eggs in the water and hatching as a tiny fish or tadpole means that Sarnothi evolution diverged at least as far back as amphibians. IIRC, blue (copper-based) blood pushes it back to fish. But the problem is, there are no intermediate stages on Earth. There are no Sarnothi equivalents of apes, or even of rodents. They did not evolve here. Someone speculated that they may have been genetically engineered from humans by an ancient human civilization – but why would such gengineers have worked hard to revert to a less efficient blood chemistry, and a more vulnerable reproductive system? OTOH, trying to gengineer lungfish up to a human level of intelligence seems like an incredibly difficult task. And any theory about ancient civilizations preceding the 5th century BC and yet far more advanced than the Greeks of that century runs into the problem that they vanished without a trace. So the Sarnothi ancestors are aliens, perhaps castaways from a wrecked spaceship, or perhaps refugees from a planetary catastrophe. ^^in reply to markm because apparently these comments can’t infinitely chain. The reproduction system is a good point! I’d actually forgotten about that. Yeah, non-shelled egg and metamorphosing intermediary stages are an even more significant divergence. If they ARE alien (even if they showed up a couple millennia ago) which it is looking likely they are, then the question becomes- why/how are they bipedal quasi-homonids? Binocular vision, okay. The general humaniform body structure, with sensory organs in a single highly-mobile nodule, near the processor, protected by a hardened portion of the skeleton, okay. Even carbon-based biology that’s compatible with Earth proteins and has the same handedness, that’s fine, since the chemistry that works for that is very limited. But the same joint orientations? The same number of limbs, and general proportions? Keratinous hair, the usage of distinct teeth, tongues and cheeks and what appear to be mammary glands? What?!? I think I’m with David here on the aliens thing. If Sarnothi really evolved on earth then at the very least they should have spread to the other great lakes, and any other nearby large lakes, ages ago. The winter might naturally stop them from being able to live on land indefinitely (although we don’t know how long they’ve had the tech to counteract that) but there’s no reason for every large body of water in that region not to have a settlement. Also, if it was evolution, and there was something that prevented them from spreading to other bodies of water, then why on earth did they evolve land capable legs? unless perhaps they used to have settlements on the shore and the native americans fought them back into the water, but that seems unlikely. Its a good theory. Its hard to imagine without artificial intervention how the sarnothi would develop the full time, lifelong dual air/water respiratory systems that no other earth creature shares. Remember the “Alien Autopsy” film? But for the Sarnothi, wow, the field is open. I’m split between “evolved on parallel Earth” and “extra-terrestrials chose Earth because of similarity in proteins and availability of bacon”. Unh, bacon,…. Bacon, Bacon, Bacon, Backkkkkooooonnnnn! And fish heads; Eat them up, yum. I’s not greens. I’s periwinkle! I am now wondering: did she mean to be ‘more careful with the blueberries’ because she was implying she got them all over herself and stained herself blue, or implying she ate too many and turned her skin blue (like that episode of Magic School Bus where the one kid turned orange because of eating too many orange foods)? Or perhaps it’s a warning not to accept blueberries from eccentric candy factory owners. With any luck this will become a Q&A session with her classmates and not a preamble to torches and pitchforks. Send Lawyers, Guns, and Money. The sh** has hit the fan. I (suspect, think, fear) that Star rhymes with Scar, and that if said boy doesn’t snap his yap ASAP, Scar and Star will both have prostheses. Her comeback is also making me wonder, all of a sudden, if Sarnothi can drink alcohol. I know they can drink tea and have herb rubs on their meat, but how far does that go? Every alcohol is made out of plants. Are they even able to metabolize alcohol, regardless of plant content? Do they have some kind of lakeweed-based alcohol, or is it so alien to their system it would be poisonous to them? I know that with aquariums, if you have a sick fish, one of the ways to euthanize them is to use a combination of clove oil and vodka. You put the fish to ‘sleep’ with a few drops of oil, then pour in the vodka to kill them. Datawog, alcohol actually wont kill the fish. The clove oil does, coats their gills, the alcohol gets em drunk just like you or me. one of the ways of adding carbon to a tank so as to promote plant growth instead of CO2 injection is a capful (10-20ml per 55 gallons or so) of vodka. Fermented mare’s milk! No plants! Comin’ again to save the motherf***in’ day, yeah! Well, I mean, she’s not WRONG…. I’m pleased with the instinctual response, myself. The rest can be taught. Still feels like Mina is just repeating a slogan and talking over the children’s heads. Selkie is actualy engaging them which I think is the more sucesfull aproach here. Well, Mina probably doesn’t actually know anything about the situation. She’s doing what she can to establish a baseline attitude, but she can’t share information she doesn’t have. What more can she do, train a gun on then and announce, “You will be friends!”? Teachers must watch what they say, too. LOVE Selkie’s response and relatively laid-back attitude as she gives it. Under American jurisdiction. Children of foreign diplomats are not citizens, even if born on American soil. There’s also Elk v. Wilkins (1884), which ruled that Native Americans who are born under the jurisdiction of a tribal government are not covered by the Citizenship Clause of the 14th Amendment. Congress later passed the Indian Citizenship Act of 1924, making Native Americans born on US soil automatic citizens just like anyone else. As I understand it, Congress could theoretically overturn the Indian Citizenship Act of 1924, making those Native Americans born under tribal jurisdiction no longer automatic citizens. It’d be political suicide, but it could be done. If asked, a judge might rule that those precedents apply. Or, they might not — there are some big differences. Practically speaking, under these circumstances, I think the US government would really, really, prefer not to have the issue tested in the courts at all. What matters most for the refugees is how they are perceived in public opinion. There’s certainly a widely accepted American belief that there IS an automatic birthright citizenship, even for persons they find scary. However, this could easily be undermined if someone (Trunchbull?) starts agitating against them, focusing attention over and over again on those potential legal loopholes. Might be she was born in sarnoth instead, though. And one could probably argue those laws as written only apply to humans to begin with so it would all be moot. Sarnoth is still within the boundaries of the U.S. from what Dave has told us. Thanks so much for this comic Dave. 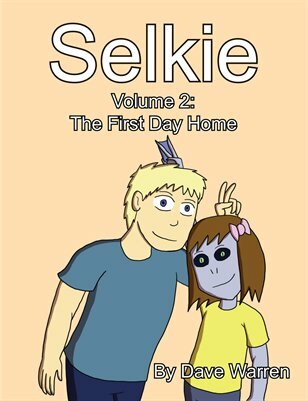 So many of us that read and never post really do get great enjoyment and happiness from Selkie and the gang. She seems American enough for me. But she’s been going to school with these kids for how long? Shouldn’t they be more like, “Ooooh. That makes sense now.” Rather than “*horror*”? Beers guns steaks Fight me… That Is beautiful, brings a tear to my eye. I just find it fascinating that the Muslim character is telling the children to respect different kinds of people regardless of whatever scariness is on the news. Is this a deliberate bit of Reality Subtext, Dave? I would assume she is either a serial killer, or has learned to be very patient. She’s been in Selkie’s position many times. It’s a “happy accident”, not intentional. She’s giving the speech because she’s the Teacher and the news just had some guy who looks very similar to one of her students pronounce the existence of a secret second sentient species, more than because she’s a Muslim. My own theory is that the Sarnothi (and their eels) originated as freshwater amphibious aliens in an interstellar(?) spaceship that landed in Lake Superior some time ago. They have been trying to survive as a colony ever since. – Their main settlement exists only in one place, in Lake Superior. – They aren’t naturally adapted to Lake Superior conditions. It is too deep, too cold, and they spend all their time under water. Their species must have evolved to sentience in warmer, shallower waters where the ability to walk on land was useful. If they had done that on Earth, there would be related species and fossil evidence. – Also, as someone pointed out a few days ago, Lake Superior hasn’t existed long enough for Sarnothi to have evolved all the way to a high civilization in that location. – The complete dependence on eels for food and clothing sounds a lot like a simplified spaceship life support system. That’s not proof by itself — look at pandas! but it fits with the hypothesis. – They possess highly advanced technology, but are gradually losing it. – They also had a strongly-defined clan structure, which is now disintegrating into conflicts. How long ago did they arrive? It is possible that it was long enough ago that everyone, both in Sarnoth today, and in the refugee settlement, was born on earth. That would make all of them earthlings. Would it make them Americans? Well, if Sarnoth is in the portion of Lake Superior claimed by the US, then by US law… yes. Everyone born there would be Americans. The refugee settlement lake is in the US, so everyone born there is also American. In any case, Selkie is absolutely right: she is American. Yeah, there’s no way at all that we wouldn’t have found traces of primitive Sarnothi civilization in the fossil record if they were native to Earth. They had to evolve somewhere, and I can’t imagine a sentient species could evolve in so tiny and selective a region as Lake Superior’s area, then remain there until they got to modern-level technology, and not have died off. I’m personally leaning more toward Sarnothi having evolved from/having a common ancestor with eels, like humans with gorillas, chimps, and other primates. Eels like Pants are not really eels, I think. They are superficially similar to earth-eels, but then, Sarnothi are also superficially similar to humans. As per Dave’s first idea for the comic, the world and the Sarnothi had a straightforward fantasy origin. They were one of four “bender” races that shared the Earth in the ancient past, but then the earth benders discovered technology, stopped using their magic and became the dominant species – humans. That’s all been pretty much scrapped afaik so should only be taken as trivia now. I wish to both confirm and expand on this, but Mikael is correct. Think I discussed it in a comment thread somewhere but one of the first drafts of Selkie included two other sentient races sharing Earth with humans in secret. I had recently watched The Last Airbender tv series for the first time, and was drawing heavily from it (which is part of why I scrapped the draft: too derivative). In this draft the sarnothi all had the ability to manipulate and control water (“waterbenders”). An underground race of dragons that thrived in lava had power over fire, and a cloud-city of avians controlled air. The earthbenders were humans, but they had lost the ability over time. Todd would have been the first to rediscover the art. Again this is a scrapped draft, but it was a fun idea in it’s own way. Odd. It doesn’t look like she changed the lyrics at all. Dave, are the other clans other colors as well, or just purple and green? A Llllloooong time ago there was a movie about two warring martial arts clans that were shouting that they were better than the other, because their clan color was green, or better because their color was purple. I’ve noticed Jessie’s expression in this and the previous comic. It looks like she is having a bit of problem digesting the revelation of Selkie’s non-human status. How dare these tertiary characters question the great protagonist?! It isn’t questioning. It’s calling her an alien when she isn’t. She’s just a different species and born in America. Frame 1 screams “nonchalance”, doesn’t it? And now I want to draw Selkie getting a hug from my 10-year-old-mutant Marvel OC. But unfortunately I can’t draw for craps. No, I mean my motor skills are shot. It took me till I was 16 before I could tie my shoes and my handwriting is illegible if I don’t leave spaces between lines or write the letters big enough. At best, it’d look like an uncoordinated toddler drew it. The best thing about all this is how, when the excitement dies down a bit, Selkie can make “we Earthlings” and “us normal Americans” jokes as much as she wants. I’m pretty sure that Dave hasn’t told us whether the Sarnothi evolved on another planet, on this Earth, or on Earth of an alternate universe. He might not even have the answer in his own headcanon, yet, after having abandoned the element-bender idea. Teeshirt it Dave! I want one! I’s Earthling. I’s American. Beers, guns, and steaks. Fight me! “beers, guns, and steaks. fight me” – national anthem – I don’t get it. Could someone helps me out? Is there any chance that Dave (valiant author) will share an interesting backstory to the Sarnothi community?